The free-living marine flatworm Macrostomum lignano is a powerful model organism for use in studying mechanisms of regeneration and stem cell regulation due to its combination of biological and experimental properties, including the availability of transgenesis methods, which is unique among flatworm models. However, due to its relatively recent introduction in research, many aspects of this animal’s biology remain unknown. One such question is the influence of culture temperature on Macrostomum biology. We systematically investigated how different culture temperatures affect development time, reproduction rate, regeneration, heat shock response, and gene knockdown efficiency by RNA interference (RNAi) in M. lignano. We used marker transgenic lines to accurately measure the regeneration endpoint, and to establish the stress response threshold for temperature shock. We found that compared to the culture temperature of 20 °C commonly used for M. lignano, temperatures of 25 °C–30 °C substantially increase the speed of development and regeneration, lead to faster manifestation of RNAi phenotypes, and increase reproduction rate without detectable negative consequences for the animal, while temperatures above 30 °C elicit a heat shock response. We show that altering temperature conditions can be used to reduce the time required to establish M. lignano cultures, perform RNAi experiments, store important lines, and optimize microinjection procedures for transgenesis. These findings will help to optimize the design of experiments in M. lignano, and thus facilitate future research using this model organism. Flatworms (Platyhelminthes) are a large phylum in the animal kingdom (Metazoa), many of which exhibit the capacity to regenerate lost tissues and body parts . This regenerative ability has long attracted the interests of scientists, and the free-living planarian flatworms (Tricladida) Schmidtea mediterranea and Dugesia japonica in particular have been studied extensively and yielded numerous insights into the mechanisms underlying regeneration [2–5]. More recently, a non-planarian flatworm model Macrostomum lignano (Macrostopmorpha) has been introduced into the regeneration research arena, offering an attractive combination of experimental and biological features [6, 7]. Macrostomum lignano is a free-living marine flatworm capable of regeneration anterior to the brain and posterior to the pharynx . Similar to other flatworms, regeneration in M. lignano is made possible by stem cells called neoblasts . It is a small and transparent animal that is easy to culture in laboratory conditions. These features, together with the recently reported genome and transcriptome assemblies [10, 11] and the development of a robust transgenesis method  make M. lignano a versatile model organism for research on stem cells and regeneration . Macrostomum lignano is a non-self-fertilizing hermaphrodite with a short generation time of 2–3 weeks . When cultured in standard laboratory conditions, animals lay approximately one egg per day. Embryonic development takes five days, and hatchlings reach adulthood in about two weeks. The laid eggs are fertilized, relatively large (100 μm) and follow the archoophoran mode of development ; i.e., they have a large, yolk-rich oocyte instead of separate yolk cells that supply a small oocyte. These properties of the eggs make them a good target for delivery of external agents, such as DNA, RNA and protein, by means of microinjection. The possibility to introduce foreign genetic material and modify the genome of an animal is a highly sought-after experimental property, and an integral part of the genomic toolkit in model organisms commonly used for genetic research, such as the nematode Caenorhabditis elegans, fruit fly Drosophila melanogaster, yeast, and mouse, as it broadens the range of usable experimental approaches and greatly improves the chances of deciphering biological phenomena of interest. We recently demonstrated that microinjection of DNA into single-cell stage embryos can be used to generate transgenic M. lignano animals . The technique is efficient and robust, and stable transgenic lines can be obtained within three-to-four months, including F1 and F2 crosses. However, from the experimental perspective, it would be advantageous if the time required to generate transgenic animals could be shortened. Manipulation of culture temperature conditions is one way to approach this challenge. Temperature is one of the most important factors influencing most biological processes. The overall range of temperatures that support active life on Earth stretches from as low as − 1.8 °C in polar regions to around 113 °C for thermophilic archaea at the other extreme [14, 15]. Most animals have specific temperature ranges that are optimal to their growth; this is because even small alterations in the temperature can lead to significant changes in animal metabolism. If these changes are sustainable for the organism, the increase in the temperature usually leads to an increase in the speed of physiological processes. The most common way of showing this relationship is using the temperature coefficient Q10 = (Rate 2 / Rate 1)10/(Temperature 2 − Temperature 1), which compares the rates of a process at a given temperature with the rate at temperature increased by 10 °C . The most popular way of using the Q10 index is by measuring oxygen consumption , but it may also be applied to various different measurements, such as electric organ discharge  or locomotor performance . All living organisms respond to changes in environmental temperature. Perturbations in temperature will usually trigger the heat shock response pathway, which is an ancient, universal mechanism based on specialized chaperone molecules called heat shock proteins, or Hsps . These proteins can help other proteins to fold correctly, repair damaged proteins, or degrade them. They can also be a good indicator of stress that an organism undergoes . Here we present how temperature affects development, growth, fertility, and regeneration capabilities of Macrostomum lignano. We tested the stress response to elevated temperatures by measuring the activity of the Heat shock 20 (Hsp20) gene using qRT-PCR and Hsp20::mScarlet transgene expression. Furthermore, we measured the hatching speed of M. lignano eggs when incubated at different temperatures, as well as the number of offspring produced in these conditions. We also investigated how changes in temperature influence regeneration speed in M. lignano, and the speed of the development of phenotypes upon gene knockdown by RNA interference (RNAi). Our findings establish optimal conditions for M. lignano cultures and will help inform future research using this model organism, particularly for creating transgenic animals and performing RNAi experiments. The DV1 inbred M. lignano line used in this study has been described previously [10, 22, 23]. The NL10 and NL22 lines were previously established in our laboratory . Animals were cultured under laboratory conditions in plastic Petri dishes (Greiner), filled with nutrient-enriched artificial seawater (Guillard’s f/2 medium). Worms were fed ad libitum on the unicellular diatom Nitzschia curvilineata (Heterokontophyta, Bacillariophyceae) (SAG, Göttingen, Germany). Conditions in the climate chambers were set at 20 °C, 25 °C, 30 °C and 35 °C with constant aeration, and a 14 h/10 h day/night cycle. The heat shock sensor construct KU#49 was created using a previously described double-promoter vector approach . The promoter region of M. lignano hsp20 homolog gene (Mlig005128.g2) was cloned using primers 5′-GGATGGATCCTCATTTATAAGCGTACCGTACT-3′ and 5′-TTATAAGCTTCATGCTGTTGTTGACTGGCGTA-3′ to drive expression of mScarlet-I red fluorescent protein, while elongation factor 1 alpha (EFA) promoter driving expression of NeonGreen fluorescent protein was used for the selection of transgenic animals. Two hundred thirty-five single-cell eggs were injected with the KU#49 plasmid as previously described , but without radiation treatment. Hatchlings were selected based on the presence of green fluorescence, and a stable transgenic line NL28 was established. Twenty single-cell stage eggs per temperature condition were picked and transferred to single wells in a 6-well plate. They were monitored daily, and hatched worms were immediately removed from the test well. Each temperature condition was tested independently in triplicate. To measure expression levels of the Mlig-hsp20 gene by qRT-PCR, 50 worms of the same age were selected for each of the three replicates. Animals were incubated for two hours at different temperatures (20 °C, 25 °C, 33 °C, 34 °C and 35 °C) and two more hours at 20 °C, before RNA extraction (RNeasy, Qiagen). Quantitative RT-PCR was done using the Light Cycler 480 (Roche) with 5′-CGAAGATGTCACTGAGGTCAAG-3′ and 5′-GCGCCTGCAGTAGAAGAAT-3′ as primers and GAPDH, COX and EIF as reference target genes, as previously described . Analysis of the results was performed using the qBase+ software (Biogazelle). To monitor heat shock response using Hsp20::mScarlet transgene, NL28 transgenic animals were incubated for 2 h at different temperatures (20 °C, 25 °C to 35 °C with 1 °C interval, and 37 °C), followed by 22 h at 20 °C, and then imaged using Zeiss Axio Zoom V16 microscope with an HRm digital camera and Zeiss filter sets 38HE (FITC) and 43HE (DsRed). Images were analyzed using ImageJ software. Images were converted to 8-bits, the area of the worm was selected, and the median value of the signal was measured and visualized using box plot. Graphs were generated using the ggplot2 package for R.
Three sets of 20 freshly hatched worms were selected per line and temperature condition. They were kept in the selected temperature until the end of the experiment, a total duration of five weeks. Twice per week, the worms were transferred to new plates with fresh food, and the old plates, where animals laid eggs in the preceding time interval, were incubated until all eggs were hatched, after which the hatchlings were counted. The approach of counting hatchlings as a proxy to the number of laid eggs rather than the direct counting of eggs was chosen because it is easier and more reliable to count hatchlings than to count egg clumps. Twelve NL22 worms expressing GFP marker in testes  were used per condition and cut above the testes. The worms were then placed in 12-well plates with fresh diatom and monitored daily. The days of the first appearance of GFP signal in the testes and in the seminal vesicle were noted and used to measure the time required for regeneration. For the knockdown of Mlig-ddx39 gene, 15 worms per temperature condition (20 °C, 25 °C and 30 °C) were selected and treated with Mlig-ddx39 dsRNA fragments as previously described . The morphology and viability of the worms was monitored on a daily basis and any abnormalities were noted. GFP dsRNA was used as a negative control. For measuring the efficiency of Mlig-ddx-39 knockdown, qRT-PCR was performed in the same way as described above for the Mlig-hsp20 gene but with Mlig-ddx39 primers 5′-ACCCAGAGCTGCTGGACTAT-3′ and 5′-GTAGGAGCCCTTGTGACCTG-3′. For the knockdown of Mlig-sperm1 gene, twenty worms per temperature condition were treated with Mlig-sperm1 dsRNA fragments as previously described , and the number of animals with the enlarged testes were counted on day 4 of the treatment. Commonly used laboratory conditions for Macrostomum lignano cultures are as follows: temperature of 20 °C, humidity 60%, and light/dark cycle of 14 h/10 h. These conditions were chosen mainly because they are optimal for the growth of the diatom Nitzschia curvilineata, which is the main food source for the worms . To assess the temperature conditions that can be used in the experiment, we first established the temperature range in which the worms survive. While freezing the worms proved to be lethal, they could survive when kept at 4 °C for at least two weeks. However, because the diatom does not grow in these conditions, we decided to exclude 4 °C from further experiments. Other temperatures below 20 °C were also excluded from the experiment, since the primary objective of the study was to find conditions that accelerate growth and development. On the other side of the temperature spectrum, the worms dissolve when kept at 42 °C for two hours, and died after one week of culture at 37 °C. Therefore, we have decided to use 20 °C, 25 °C, 30 °C and 35 °C as our experimental conditions to study long-term temperature effects on M. lignano (Fig. 1). To investigate which temperatures induce stress response in the worms, we monitored the activity of the heat shock 20 promoter (Mlig-hsp20). First, we performed a quantitative RT-PCR to measure the expression level of Mlig-hsp20 at 20 °C, 25 °C, 30 °C, 33 °C, 34 °C and 35 °C. There was no significant difference in the expression level of Hsp20 between 20 °C and 25 °C (Fig. 2a). However, a small (2-fold), but significant (P = 0.027, t-test), increase in the expression was observed at 30 °C compared to 20 °C (Fig. 2a). More than a ten-fold raise in the expression level was observed at 33 °C, which increased to more than 100-fold at the highest tested temperature of 35 °C (Fig. 2a). In the second test we created a transgenic line expressing mScarlet-I protein under the control of the Mlig-hsp20 promoter (Fig. 2b) and measured the level of fluorescence 24 h after a 2-h incubation at different temperatures ranging from 20 °C to 37 °C (Fig. 2c, d). More than two- and ten-fold increase in the fluorescence was observed at 34 °C and 37 °C respectively (Fig. 2c). According to Morris et al. , it takes around 120 h (five days) for Macrostomum eggs to fully develop when eggs are kept at 20 °C. To investigate how the temperature affects the speed of embryonic development and hatching, we picked freshly laid embryos and monitored their development until hatching at different temperatures. To investigate potential differences due to genetic background, we used two M. lignano lines that are currently used in a majority of studies on M. lignano, the DV1 and NL10 lines. These lines are independently derived from wild-type populations from the same geographical location and differ by a whole-chromosome duplication but otherwise behave very similarly under laboratory conditions . We first studied the effect of low temperature. At 4 °C the development of the eggs is arrested and they can be stored for at least one month, and resume their development once returned to higher temperatures. Next, we studied how quickly the eggs develop at temperatures between 20 °C and 35 °C. As shown in Fig. 3, when kept at standard conditions (20 °C) the eggs started to hatch after six days. Increase in the temperature resulted in proportionally faster embryonic development and earlier hatching, which was two times faster at 35 °C compared to 20 °C and took only three days. Of note, about 10% of eggs remain unhatched after eight days of incubation at 20 °C, compared to less than 5% at higher temperatures, suggesting that even the highest tested temperature of 35 °C does not have detrimental effects on the survival of embryos. The reproduction rate is a very important factor for a model organism, since animals with shorter generation time enable faster generation of data in genetic experiments. In addition, if animals produce large numbers of offspring, the generated data will, in most cases, have higher statistical power. To assess the temperature impact on M. lignano reproduction rate we have compared the number of offspring generated over the course of five weeks by worms kept at different temperature conditions. The experiment was started with hatchlings to incorporate postembryonic development in the study, and both DV1 and NL10 line were used. It took the hatchlings of both lines three weeks to grow and produce first progeny at 20 °C, while at 25 °C hatchlings were observed in two weeks for NL10 line but not for DV1. At 30 °C and 35 °C both lines produced progeny already after two weeks (Fig. 4). From three weeks onwards, the number of hatchlings produced per week increased from below 200 at 20 °C to more than 300 in temperatures above 20 °C; hatchling numbers were highest for worms kept at 30 °C. This was true for both genetic backgrounds, and we did not observe significant differences between DV1 and NL10 lines (Fig. 4). Although temperatures of 30 °C and higher resulted in more hatchlings, it also activates a heat shock response (Fig. 2). To investigate the long-term effect of the elevated temperature and potential stresses that it can have on the worms, we kept the worms at the selected temperatures and monitored for morphological aberrations after three and six months of culturing. Worms kept at 25 °C showed no morphological changes at both check points as compared to the worms kept at 20 °C (Fig. 5). However, for both the 30 °C and 35 °C temperature conditions, various aberrations in the general morphology were observed. After three months an increased number of cysts, damaged tissue and enlarged testes were commonly present in both DV1 and NL10 lines (Fig. 5). None of the worms kept at 35 °C survived until the six-month checkpoint, and all worms that survived at 30 °C showed morphological aberrations (Fig. 5). Therefore, prolonged exposure to the temperatures above 30 °C is detrimental for M. lignano. Since the main attraction of M. lignano as a model organism is its regenerative ability, we next studied how temperature influences regeneration. It is commonly accepted that higher temperature leads to increases in overall metabolic activity . To evaluate the influence of the temperature on the time needed for a worm to fully regenerate its body after amputation above the testes region, we tracked the regeneration of testes and the appearance of sperm in the vesicular seminalis using a previously established transgenic line NL22, which expresses GFP under the control of the testes- and sperm-specific ELAV promoter . Using such a transgenic marker provides better precision, consistency and efficiency in assaying the extent of regeneration. Indeed, we observed no significant variation when assessing the time of appearance of GFP signal after amputation at all tested temperatures (Table 1). As expected, the speed of regeneration increased with temperature (Table 1). If we take the regeneration time at 20 °C as the standard rate, then for the regeneration of testes the calculated temperature coefficients are Q10 = 4 at 25 °C and Q10 = 3 for 30 °C and 35 °C. This shows that the largest effect is obtained when increasing the temperature to 25 °C, and the fastest regeneration takes place at 30 °C, without further benefit of increased temperature on the regeneration time. Hence, temperatures of 25 °C and 30 °C ought to be considered in regeneration experiments on M. lignano, as it shortens the duration of an experiment by two to three times (Table 1). Knockdown of gene expression by RNA interference (RNAi) is currently the primary approach for loss-of-function studies in M. lignano . In this approach animals are soaked with double-stranded RNA against the target gene, and often prolonged treatments for several weeks are required to observe a phenotype [11, 25, 27]. We have tested how temperature influences the speed of phenotype development upon RNAi treatment. To do this, we knocked down Mlig-ddx39, a gene known for its function in cell proliferation in M. lignano and a robust lethal knockdown phenotype . Similarly to the reproduction test, we used the DV1 and NL10 lines for this experiment (Table 2). At 20 °C, it took around 20 days for all animals to die upon Mlig-ddx39 knockdown. When worms were kept at higher temperatures, death occurred faster: at 11 and 8 days for worms kept at 25 °C and 30 °C respectively. There was no visible difference between the two strains used for the experiment (Table 2). Next, we investigated whether the observed increase in the speed of manifestation of the ddx39 RNAi phenotype at higher temperatures is atrributable to higher efficiency of gene knockdown by RNAi, or to other factors. For this, we measured by qRT-PCR the abundance of Mlig-ddx39 transcripts at different time points after the start of the RNAi experiment at different temperatures (Fig. 6). Animals treated with dsRNA against gfp were used as reference controls. At all tested temperatures no significant variations were observed in the expression levels of Mlig-ddx39 between control samples during the course of the experiment (Fig. 6). At the same time, for the Mlig-ddx39 dsRNA treated animals a drop of ~ 80% in the level of ddx39 transcripts was observed already after one day of treatment at 20 °C or 25 °C, and even a higher drop of ~ 90% at 30 °C. However, at subsequent days, the knockdown levels stabilized at around 95% at all temperatures. Thus, we conclude that the kinetics of RNAi itself is not significantly affected by temperature. 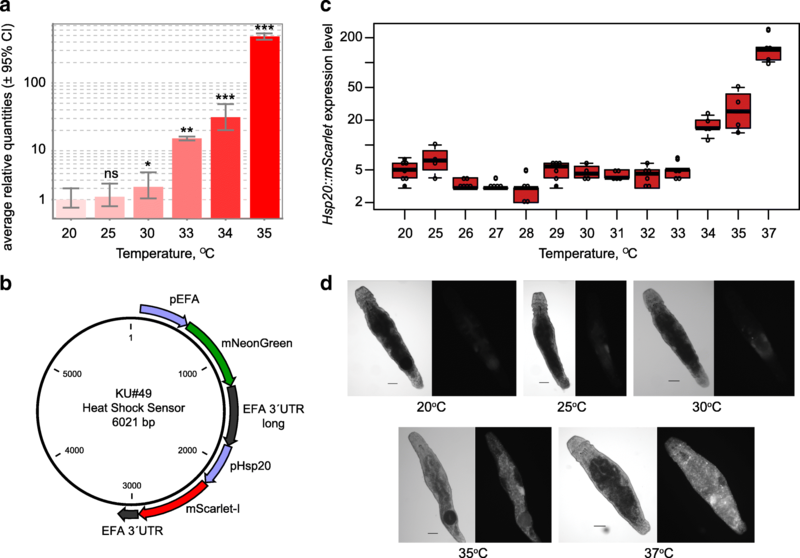 Instead, the observed shortening of time for the manifestation of the Mlig-ddx39 RNAi phenotype at higher temperatures can be explained by the increased rate of cell turnover. To test whether the acceleration of the development of RNAi phenotypes at elevated temperatures can be generalized to other genes, we investigated Mlig-sperm1 gene, knockdown of which leads to abnormal sperm morphology and enlarged testes . This is a slow RNAi phenotype that takes 2–3 weeks to develop at 20 °C . To quantify the extent of the phenotype at different temperatures, at day 4 of RNAi treatment we counted the fraction of animals with testes enlarged to the extent that they were touching each other. (Fig. 7). Similar to the results with Mlig-ddx39 RNAi, higher temperatures resulted in faster development of the phenotype, and while no sufficiently enlarge testes were observed after four days of dsRNA treatment at 20 °C, 25 and 85% of the animals had developed enlarged testes at 25 °C and 30 °C respectively (Table 2). Hence, similar to regeneration, RNAi phenotypes can be accelerated with temperature in M. lignano and higher temperatures can be used to shorten the duration of experiments. Temperature is a key factor in the husbandry of laboratory animals, and knowing the optimal values helps to provide them with the most suitable conditions. Changing the temperature has long been used as a method to influence the growth of model organisms, as best seen in the case of C. elegans [28, 29], and recently the role of temperature in the biology of planarian flatworm Schmidtea mediterranea was investigated . Here we tested how different temperatures affect the biology of the flatworm Macrostomum lignano (Table 3). While worms can be kept at 4 °C for two weeks, freshly laid eggs can be stored in these conditions for much longer. For practical purposes, this is useful for back-up and long-term storage of valuable worm cultures, such as transgenic lines, and for collection and synchronization of eggs for subsequent microinjection. The ability to collect one-cell stage eggs and prevent their division by keeping them on ice or in a refrigerator provides a wider time window for microinjections, as it allows separation of egg picking from injection. At the same time, higher temperatures speed-up the development and shorten the time required for the worms to hatch. Incubating the eggs at 25 °C or 30 °C can save several days of unnecessary waiting time, enabling faster generation of transgenic animals. Mlig-sperm1 RNAi, percentage of animals with enlarge testes at day 4. Standard M. lignano cultures are kept at 20 °C and are transferred to fresh diatom every week, or twice a week when cultures are used for egg production for microinjections . In this way, a new population of worms can be expanded every two weeks if the starting culture is sufficiently dense. The generation time of two weeks can be quite limiting when experiments require large numbers of specimens, or when the starting culture has a small number of animals. This is often the case for establishing a new transgenic line, performing in situ hybridization, RNAi experiment or isolating nucleic acids and proteins. Increasing overall egg production by simply putting the cultures at higher temperature can be used as an easy method to quickly generate a large number of worms. However, one must be cautious to avoid undesirable stress response that could potentially lead to distorted results. While keeping the animals at 30 °C can result in a significant increase in the egg production, the changes in the morphology, visible already after three months, indicate that these conditions may cause too much stress to the worms. Indeed, we observed mild heat shock response activation at 30 °C, which quickly increases with further rising of incubation temperature. Regeneration is one of the most prominent features of flatworms, and M. lignano provides a powerful experimental platform to study this phenomenon. We demonstrate that speed of regeneration increases with temperature in M. lignano, which can be taken into account and used to shorten time required for an experiment when needed. Similarly, gene knockdown by RNA interference is temperature-dependent and RNAi experiments can be accelerated by increasing the temperature. Importantly, the efficiency of gene knockdowns itself is not substantially affected by temperature, but the phenotypes develop faster, presumably due to elevated cell turnover. Notably, the dependence of the manifestation of RNAi phenotypes on cell proliferation has been previously reported in planarian flatworms . 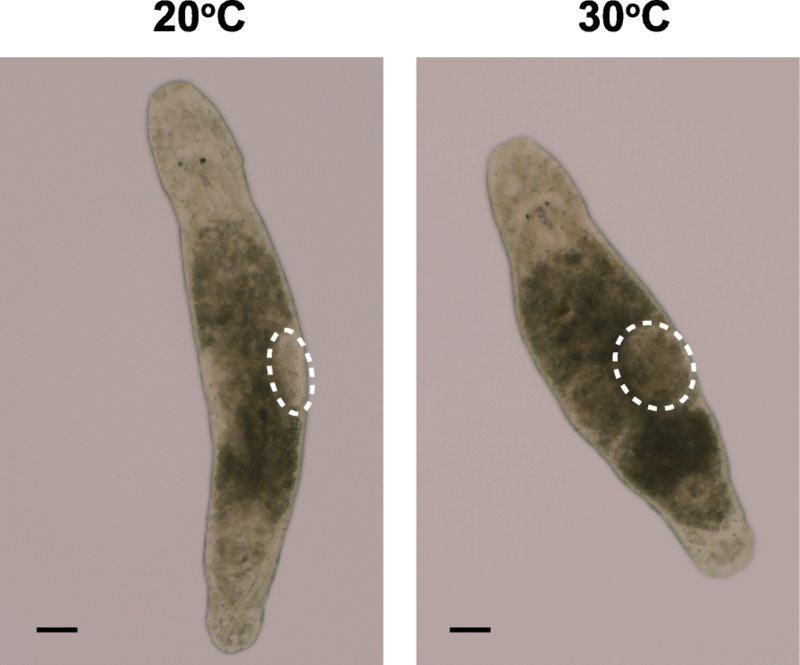 In this study, we show that simple temperature control can significantly benefit a wide range of experiments using the flatworm model organism Macrostomum lignano. Based on our results and experience, we propose the following: (1) use 4 °C for storing the eggs and keeping them prior to microinjections; (2) use 20 °C for standard cultures that do not need rapid expansion, thus reducing the frequency of transferring the animals to a fresh food source; (3) use 25 °C for cultures that need to be quickly expanded and for the eggs that need to be hatched faster, for example microinjected eggs; (4) use 25 °C or 30 °C for RNAi experiments to observe the desired phenotype faster. We thank Stijn Mouton for valuable comments on the manuscript. The DV1 line used in this study is a gift from Schärer laboratory. This work was supported by the European Research Council Starting Grant (MacModel, grant no. 310765) to EB. KU was supported by the project 0324–2019-0040 from the Russian State Budget. The work on heat shock response was partially supported by the Russian Foundation for Basic Research (RFBR, grant no. 18–34-00288). JW, KU, LG and EB designed the study. JW, KU and LG performed experiments. JW, LG and EB analyzed the results. JW and EB wrote the manuscripts. All authors read and approved the final manuscripts.